The Internet Explorer 9 “Beauty of the Web” event invitations went out today and the first thing that struck me was how the style of the featured text looks exactly like those from the Zune website. A coincidence, or something more? After all, the consensus of the Zune experience is that it’s beautiful. I realy hope they don’t go with the old looks. Most likely something more…it seems to me that Microsoft is doing a much better job of integrating things and bringing everything together. I wonder if it’s a new UI…? Well, that font and the way they use it are more or less trademarks of the Metro stylings. Especially the manner in which they’re using it in this invite is reminiscent of Zune’s material. It’s not Segoe UI. It’s Segoe Light. Yes, that’s exactly what its like saying. And its true, they are. @Long You know what I mean. It’s the Segoe font, and its 1000 varieties: Segoe UI, Segoe WP, Zegoe, Segoe Light, Segoe Decaf, Segoe Macchiato, etc. There’s no hate, all I’m pointing out is that there’s nothing unique about the IE9 invites, it’s in line with Microsoft’s branding across many of its products, including Zune. In other words, we shouldn’t read too much into the branding similarities between the IE9 invites and Zune. Although I agree that there’s a strong possibility that the IE9 UI will be Zune/Metro-inspired, this wouldn’t be the evidence to back that claim up, or even to suggest it. 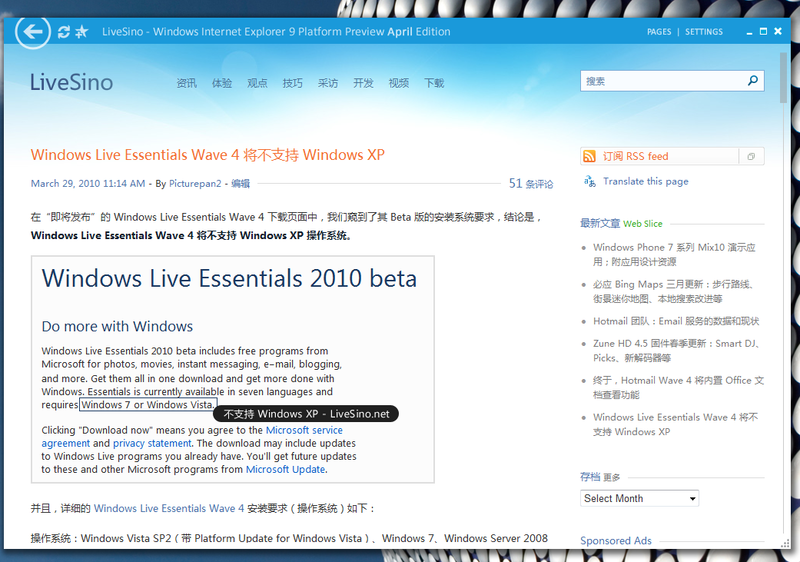 Many sites are now stating that the chances are good that IE9 will feature a Zune like appearance and experience. I’m also hoping that there is some type of Zune music playing integration or plug-in available at launch. Microsoft’s Bend text editor is another outstanding example of what can be created with the Metro Ui. The animations are also outstanding. I was going to include the link to download it, but it appears Microsoft has removed it from it’s codeplex site.However if you are interested, do a search for Bend Text Editor and you will find tons of sites with screens shots. Unfortunately, they don’t do justice to the animations that are a big part of this app. I thought Bend wasn’t made by Microsoft..? It was a 3rd party app inspired by metro and zune. I was gonna tweet that just about when Tom said that IE9 wouldn’t be Metro (or Ribbon) based. The invite design made me feel that we’ll see at least some Metro elements… it’s minimalistic IMHO. Oh god I hope and pray Sinofsky lets them adopt Metro for the IE 9 UI. In reality, its probably a good evolution of the IE 8 UI, but I would be incredibly pleased if they decided to surprise everyone. It’s more inline with VS / NET branding than Zune. I really want to see a Metro UI used with IE9. That would be amazing. It would be great if the background image of “The Beauty of the Web” was released as a wallpaper. I mean look at it.It would fit Windows 7 sooooo good. Segoe Light and gradients are Zune-y now? They’re not even doing it in the all-lowercase style that is pervasive in the whole zune experience. Zune uses Zegoe font 😛 it’s not quite segoe. I am NOT a fan of that ie icon/logo. The new IE logo looks… well… meh. Not good. No mentioning of the new logo? I kinda like it. Fits very well with the other Windows Live icons. The new IE logo looks good. I have to admit that IE has imporved in recent years and is probably the most used browser in the world, but I still prefer Firefox and Microsoft have a long way to go, especially when it comes to additional functionality – addons. While I hope and think there should be a UI refresh, my gut tells me this is just a nod to IE9 text rendering advances. I wonder whether they have rewritten the UI in WPF. VS 2010 seemed to turn out pretty well. It would be quite amazing if IE9 was the next big product to take the plunge. I just hope it’s going the other way as well and we see a new IE on the ZuneHD itself with flash and silverlight support. Yeah, they look alike. They also look like any other word effect from Office. As long as it looks better than IE7/8, then I’m hopefully. I’d like to see some sort of chrome/opera look.